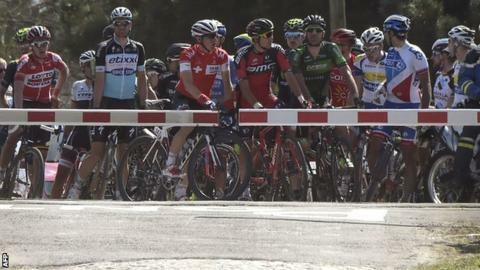 Several Paris-Roubaix riders were seconds from being hit by a train as they raced over a rail crossing while a TGV approached. Seven riders in the peloton crossed with the safety barrier down, but were not sanctioned for breaking race rules. Sir Bradley Wiggins finished 18th in his final race for Team Sky, 31 seconds behind German winner John Degenkolb. "It's the most beautiful race in the world and we get bothered by a train," said French champion Arnaud Demare. "This needs to be taken care of, it was dangerous. We went through but it was close." One rider from the Belgian Lotto team was clipped by a barrier which came down seconds before the 60kph train sped past. Race organisers said the peloton were 10m from the barrier as it started to descend and that the leading riders "could not stop in safe conditions". A police motorcycle stopped the rest of the pack, before organisers of the 151-mile race slowed the leaders to allow the pack to catch up. Former British champion and Olympic track medallist Rob Hayles, commentating on BBC Radio 5 live sports extra, said: "That could have ended in disaster. "You could see riders nip across but that train wasn't slowing down." A similar incident occurred last year but it affected only the eight men in the breakaway. In 2006, three riders who were chasing a lone breakaway by eventual winner Fabian Cancellara were disqualified after crossing a railway line after the barrier was down.